Wrexham Glyndwr University’s new Chancellor will be officially installed this week at a ceremony at the William Aston Hall. Sporting legend and world record holder Colin Jackson was given an Honorary Fellowship for his services to sport by the university in 2016. Colin was born in Cardiff and is one of the finest and most loved athletes Great Britain has ever produced, winning numerous records and multiple world titles. After retiring from athletics, Colin has seamlessly made the transition into broadcasting, most notably as an integral part of BBC Athletics. Speaking at the time, the former 110m-hurdles world champion, said: “It is an honour and a thrill to take up the position of Chancellor at Wrexham Glyndwr University. The Chancellor role is an ambassadorial one, which will see Colin preside over graduation ceremonies and other on-campus events. 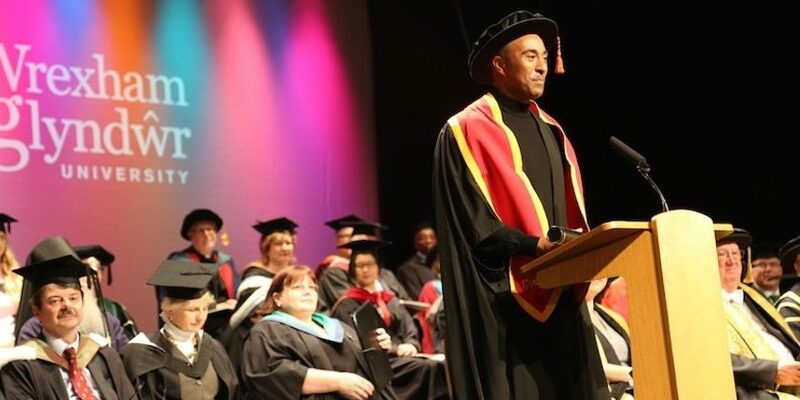 Wrexham Glyndwr University Vice-Chancellor, Professor Maria Hinfelaar said: “We are delighted to welcome Colin Jackson as our new Chancellor. “He joins us at a very exciting time as we progress with our Campus 2025 programme to improve our campuses and facilities, which includes our partnership with Football Association of Wales to build the new National Football Development Centre at our Colliers Park site in Wrexham. Members of the public are invited to attend the ceremony on February 15 at Wrexham Glyndwr University’s William Aston Hall free of charge. Doors are open from 11am with the ceremony beginning at 12pm. This is a ticket only event – tickets can be obtained from Wrexham Glyndwr University’s main reception or alternatively reserved online here.